And so we took to the road for our latest editorial, heading east out of London to the exotic-sounding Mersea Island - a hard-to-reach island situated on the gusty Essex coastline. The tide was out and the sun was flickering behind the clouds, shining just enough for Ilona to traipse the shore in a wardrobe of suits, cosy two pieces and the odd vintage swimsuit thrown in for good measure. We called on minimalist masters Charlie May for a few key basics and Bulgarian brand By Far provided the most effortless of slip-on mules. The rugged setting proved to be a perfect backdrop for the menswear-inspired wardrobe, all captured by Emma Sweeney. Hair was kept simple and texturised thanks to a good gust of sea breeze and a handy MiTi hair tie to sweep it back. Britain’s beaches aren’t just about flip flops and fish and chips you know, we suggest you head to one and find out. 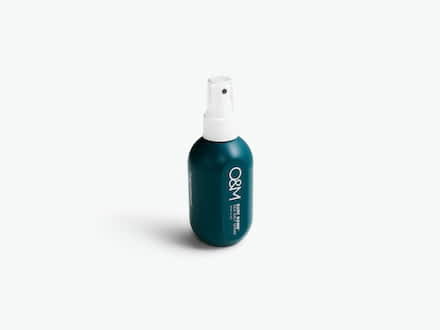 Give hair that gritty seaside texture with a good spritz of Original Mineral’s bestselling Surf Bomb spray. Heavy makeup takes a backseat and makes way for a rosey-gold glow in the form of RMS’ Master Mixer. Dabble wherever you please and wait for your skin to catch the sunlight.